Even though nowadays it isn't difficult to find an Internet connection wherever we go, it is always possible that we may need to check a website somewhere where it is impossible to find a connection. It could also happen, that you need to download a website to see how it has been generated or to check anything, if you want to store a website on your hard drive, Website Ripper Copier can help you out. This software allows you to indicate the website that we want to download and seconds later we will have it on our desktop, packed so that we can preview it at any other moment. Furthermore, its advanced download engine offers the possibility to differentiate kinds of files, allowing the user to download those that have a specific extension (like JPG images, for example) o even access private zones by means of user a name and password provided by the user. The download of any website can be carried out whenever you want and if a file doesn't download correctly or the connection is lost, it is possible to resume the download. Thus, it is sure that no part of a website that we want to download will be out of our reach. 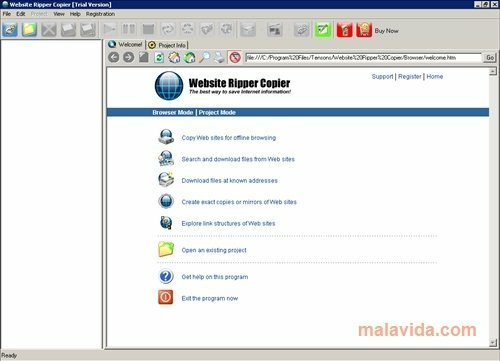 On the other hand, once downloaded, Website Ripper Copier allows you to prepare the websites to burn them on a CD or DVD and be able to view them from there. This download requires that we have Microsoft .Net Framework 1.1 or above installed. The trial version has certain limitations.